Can drones and planes safely share the skies? The summer of drones is here. The Federal Aviation Administration released rules for the commercial use of drones on Tuesday, which will allow the nascent industry to fully emerge in August. The long-awaited rules will allow businesses to legally use drones under 55 pounds for purposes such as monitoring crops and construction sites, finding missing persons, inspecting infrastructure and filming movies. The new rules require drone operators to fly within their line of sight and no faster than 100 mph. Drone pilots may not fly over anyone not directly participating in the operation. Evening flights are not allowed, except during twilight with anti-collision lighting. The rules will be especially empowering for businesses that need to inspect towers and antennas, a notoriously dangerous job. According to the Occupational Safety and Health Administration, there were 13 deaths on communication tower sites in 2014, despite fewer than 15,000 workers. 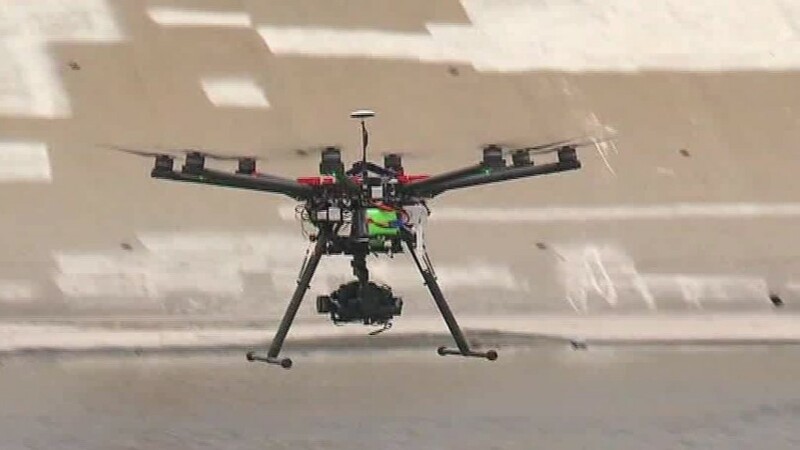 While the new rules require drones to fly no higher than 400 feet, there is an exception when operating near a structure, such as a building, cell tower or antenna. Because airplane pilots already give tall structures a wide berth, there isn't a risk of the high-flying drones endangering planes. There is no cap on a drone's height if it's operating within 400 feet of a structure. With drones legally flying high, businesses won't need to put humans in harm's way as often to complete their inspections. "We do believe there's inherent safety value in the use of drones," said Todd Schlekeway, the executive director of the National Association of Tower Erectors. "Anything we can do to mitigate that risk is of tremendous importance." He said drones could eliminate 30% of the climbs that tower technicians make to maintain the country's communications infrastructure. "You're always worried, you have a tower 2,000 feet off the ground and humans working that high, there's always a concern," said Jason Effinger, the chief digital and technology officer at Gray Television, which operates 180 towers and antennas around the United States. "There's a great opportunity to reduce the number of climbs we need to have at many of our towers." He thinks the number of climbs required for his towers can be cut in half. Gray Television hadn't used drones yet, although many businesses have done so by seeking an exemption from the FAA. Ed Silva, the chief executive of Aerial Works in Rockledge, Florida, collects aerial imagery and conducts cell tower inspections with drones. He said he's relieved that the new rules will simplify the paperwork and bureaucracy he's had to wrangle with to get a government exemption to operate his business. Silva said he's waited months to get FAA approval for specific flights, and has watched as unscrupulous competitors went ahead and did the work. Silva said the safety benefits of using drones rather than putting a person in harm's way attracted him to the field. "Anything we can do with technology to improve the safety of our elevated workers is a good thing," said Phil Larsen, the president of Hazon Solutions, a drone company whose business includes tower inspection. "This will have a massive, positive impact for all businesses. The FAA has given us that freedom with this rule."